Doctor Michael K. Seidenstein is a Board Certified and Fellowship trained Orthopaedic Surgeon. He is licensed to practice in New Jersey, New York, and California. Dr. Seidenstein has practiced Orthopaedic Surgery since 1976, and specializes in reconstructive surgery, including arthroscopic surgery of the upper and lower extremities. He is renowned nationally and internationally for his expertise in reconstruction surgery. Dr. Seidenstein is known for his surgical capabilities in handing particularly difficult or compromised orthopaedic cases, and in cases when a second opinion is sought. 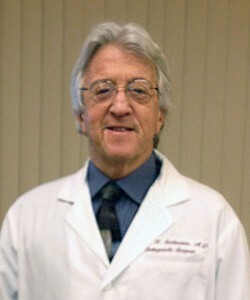 Dr. Seidenstein received his Medical Degree at New York Medical College in New York. He completed his internship at New York Medical College, Flower and Fifth Avenue Hospital, and his residency at the Hospital for Joint Diseases and Medical Center in New York. He continued his orthopaedic training through several Fellowship appointments as a result of his early academic achievements, which included scholarly and surgical work under the tutelage of Professor Sir John Charnley of England (known as the Father of total joint replacement technology). In Germany, Dr. Seidenstein studied with Professor Heinz Wagner, who developed resurfacing techniques and limb lengthening. Furthermore, Dr. Seidenstein served as an Instructor of Orthopaedic Surgery in Davos, Switzerland. Dr. Seidenstein is a member of many prestigious medical societies. He has received Fellowship honors from the American Association of Orthopaedics (AAOS), American Board of Orthopaedic Surgeons (ABOS), American College of Surgeons—Orthopaedic Surgery (ACS), International College of Surgeons—Orthopaedic Surgery (ICS), and Low Friction Society. Furthermore, as a member of the eminent International Society of Orthopaedic Surgery and Traumatology (SICOT), he continues to perform reconstructive surgery in Milan, Italy. At the local level, Dr. Seidenstein is actively affiliated with the American Academy of Medicine of New Jersey (AMNJ), Eastern Orthopaedic Association (EAO), and New Jersey Orthopaedic Society (NJOS).